Some cultural projects manage to become an actual brand. Each year, the Cultural Brand Awards honor the people and institutions that go one step further in promoting Europe's cultural identity. It took four years to build the museum located on the bank of the Nervion River. Clad in glass, titanium and limestone, the Deconstructivist structure designed by architect Frank O. Gehry appears to defy gravity. It has been hailed as the "greatest building of our time" by one of his colleagues, architect Philip Johnson. It's hard to believe that such a building could emerge from a draft that looks like mere scribbles. When designing a building, Gehry says that he prepares several sketches in this style — usually spending 15 seconds on each one. He keeps drawing until he feels he's found the right design. The central atrium, 50 meters high, is flooded with light and offers tons of playful details for the eyes: towers, gallery, corners, ramps, windows and lights. Still, the delightful architecture of the building's interior doesn't steal the show from the art. Commissioned by the museum and of the permanent exhibition, Richard Serra's sculpture series "A Matter Of Time" is truly monumental. Frank Gehry even had to design a special large hall for the massive pieces made of steel. The "Fish" gallery is 142 meters long and 27 meters wide and comprises different works by Serra, his "Spiral" and "Ellipse" variations, as well as his "Snake" sculpture. "Maman" is the name of the famous installation by French sculptor Louise Bourgeois on the museum's forecourt. It is made of bronze, almost 10 meters high and weighs over eight tons. The name "Mommy" comes from the fact that the spider carries 26 marble eggs in her sack. "Maman" has many sisters around the world, for example in Tokyo, Saint Petersburg, Ottawa and Seoul. "Puppy" is the name of the cute, 12-meter-tall flower dog created by the American art superstar Jeff Koons. The artist planted 17,000 marigolds, petunias, begonias and other flowers on the puppy-like statue, and although he is supposed to guard the museum, he is always keen to pose for a photo. In 2015, the museum held a major retrospective of the popular artist. American artist Mark Rothko was one of the main figures of abstract expressionism. He let the colors on his paintings speak for themselves to achieve a direct communication between the picture and the viewer. The surfaces, shadows, patterns and brush strokes he created were never random. "Untitled" (1952), above, is one of the museum's highlights. In 2004, the Guggenheim Museum in Bilbao dedicated a large exhibition to pop art pioneer James Rosenquist. The artist, who died in April 2017, is renowned for his huge paintings in which he'd compose seemingly random motifs in oversaturated colors. The artwork in the picture, the "Star Thief," was a loan from the Museum Ludwig in Cologne. In 2012, the museum featured the largest exhibition ever dedicated to the early work of the Swedish pop artist Claes Oldenburg. His style is characterized by oversized sculptures of everyday objects such as lipsticks, clothespins, cakes, burgers or fries with ketchup made of cheap materials. The show then traveled to Vienna, Cologne and New York. To celebrate the 20th anniversary of the institution, the Guggenheim Museum was lit up by an impressive 3D light installation that took place over four evenings in October. The performance was created by the British video designers "59 Productions" and took viewers on a journey throughout the history of the museum and art. During an event called the "Night of Cultural Brands," which took place on Thursday evening in Berlin, the European Cultural Brand of the Year 2017 recognition was awarded to the Guggenheim Museum Bilbao. The 38-member jury of the Cultural Brand Awards chose to honor the museum for the fact that it had positively affected the entire city of Bilbao and its culture. The top-class museum has become a leading cultural brand on the European market, the jury argued. Bilbao has good reasons to be proud. For 20 years now, the Basque capital has housed one of the world's most famous museums. The Guggenheim Museum, with its splendid architecture built by Canadian-born architect Frank O. Gehry, has instilled new wealth into an industrial city that had previously been on the decline. By now, the museum attracts roughly one million tourists per year. The museum's 20th anniversary was celebrated throughout the year. The show "Reflections," a highlight of the celebratory program, was an event held over four nights held in October, during which the building's glass and titan facades were illuminated by a light installation. Star architect Frank Gehry was fascinated by the idea: "The arbitrarily drawn curves of the buildings have been created with the intention of catching light," he said. From the 19th century until the 1970s, Bilbao was the most significant industrial port city of the Basque region. With its strategic access to the ocean, Bilbao's economy — based on shipbuilding, as well as coal and steel production — was booming. However, industries didn't adapt quickly enough to changing technical standards. The outdated dockyards and factories had to close. Factory buildings and ironworks were abandoned. Bilbao's revival would only come in the early 1990s, when the European offshoot of the Guggenheim museum opened right by the city's river. Four years later, the entire Nervión region was revived, with its biggest attraction being the Guggenheim Museum. The economic revitalization of the region occurred through culture, a phenomenon described since as the "Bilbao Effect" or "Guggenheim Effect." Created in 2006, the Cultural Brand Awards' statue, called the Aurica, stands for the excellence, attractiveness and diversity of the European culture market. Prizes are awarded in seven categories, including for the best marketing strategies deployed by cultural providers, for the most creative culture sponsoring investments into culture, the most innovative education programs and the most dedicated culture managers of the year. This year, a total of 104 applications came in for the prestigious prize of which 22 were shortlisted. Along with the Guggenheim Museum, Hamburg's Kulturfabrik Kampnagel and Austria's broadcaster ORF 1 were nominated in the European Cultural Brand of the Year category. Among the other prize winners are Frances Morris, director of London's Tate Modern, in the category European Culture Manager of the Year 2017, as well as Dr. Gereon Sievernich, director of the Martin Gropius Building in Berlin, who received a special award for his lifetime achievement. The winner in the category European Cultural Tourism Region of the Year 2017 is the organization NRW e.V. with its project #urbanana, which offers a discovery trip to the hidden cultural treasures of North Rhine-Westphalia. DW is a media partner of the Cultural Brand Awards. The Guggenheim Museum in Bilbao opened in 1997. The titanium, sandstone and glass building on the banks of the Nervión River, designed by Canadian architect Frank Gehry, has become a landmark in the Basque capital. It soon became an attraction for more than just architecture and art lovers. To date, 20 million visitors have brought new wealth to a city in decline. Abando Indalecio Prieto, Bilbao's main railway station, welcomes travelers with a stunning stained glass mural: 250 square meters of scenes from Basque history. At the left in the picture is the bust of Indalecio Prieto, a prominent politician and socialist who had to flee to exile in Mexico in 1939 during the Spanish Civil War. Tubular glass tunnels lead to the metro, which connects the city center with the outer districts. The tunnels are called "fosteritos" ("little Fosters"), after Norman Foster, the British architect who designed the metro stations. The metro from San Mamés station near the airport takes you into the city. To visit the Guggenheim Museum it's best to get out at Moyua Station. A steel sculpture by the Basque sculptor Jorge Oteiza has stood on the square in front of the town hall since 2002. Its Spanish name, "Variante Ovoide de la Desocupación de la Esfera," translates as "Oval-shaped Variant of the Sphere's Idleness." Jorge Oteiza (1908-2003) is considered a pioneer of abstract art in Spain and a philosopher who delved into the Basque soul. Bilbao, founded in the 13th century, was a commercial hub on the Nervión River, which flows into the Bay of Biscay. It became an industrial city in the 19th century, and was long seen as the ugly sister of the seaside resort of Donostia (San Sebastián). But Bilbao's image has been transformed. One sign of that is the city's tallest building, the Torre Iberdrola (in the center of the picture). The White Bridge, "Zubizuri" in Basque, was designed by Spanish architect Santiago Calatrava. It was built exclusively for pedestrians in 1997 and is considered by many to be Bilbao's most beautiful bridge. Its glass surface had to be covered with a synthetic laminate to keep it from being slippery in the rain. In the background stand the twin towers designed by Japanese architect Arata Isozaki. This building by the Spanish architectural firm Coll-Barreu also reflects the city's rapid transformation. The glass façade of the Basque Health Department headquarters, which absorbs noise and uses solar energy, has been a favorite photographic subject since 2008. It is located in the Ensanche area, Bilbao's main shopping district. Since 2006, the indie, pop and rock festival Bilbao BBK Live has developed into one of the biggest festivals in Europe. This year Depeche Mode, Justice and the Killers were among the bands that made appearances. In July 2018, tens of thousands of people will again gather to party and dance on Kobetamendi Hill, high above the city. In the Basque Country, wearing a beret is a political act. It's said that a citizen from Bilbao wears a hat at home, but puts on a Basque beret in Madrid. And it's claimed, as a little dig at its rival city, Donostia (San Sebastián), that there Basques wear berets only at home and hats in Madrid. "The Great Week" in Bilbao is devoted to Basque traditions. For nine days, people dance, eat and drink on the streets and squares. Giant puppets like its official symbol Marijaia make appearances. Next year the festival begins on August 18th when the traditional rocket, the txupinazo, is set off in front of the Arriaga Theatre. Picos de Europa (literally "peaks of Europe") National Park stretches inland from Bilbao. It was founded in 1918 as Spain's first national park. Some 200 peaks over 2000 meters in height offer an impressive panorama for hikers and pilgrims. The famous Way of St. James, which people from around the world follow to Santiago de Compostela, runs through northern Spain here. The Atlantic coast about 30 kilometers northeast of Bilbao offers a study in contrasts. Here there are rocky cliffs and quiet bays, deeply cut fjords and kilometer-long beaches. A spectacular stone causeway and more than 200 steps lead to the maritime chapel on the islet of San Juan de Gaztelugatxe. Once a hermitage, the islet is now a place of pilgrimage for seafarers and fishermen. Legend has it that John the Baptist left his footprints at the end of the steps. Traditionally, visitors ring the chapel bell three times and make a wish. And as the location of Dragonstone Castle in the seventh season of Game of Thrones, San Juan de Gaztelugatxe is now a must for fans of the series. From the beaches on the coast, Line 1 on the Metro Bilbao (stations: Areeta, Gobela, Bidezabal or Plentzia) takes you back into the city center in about 30 minutes. After that, it's well worth taking a stroll along the riverbank. At nightfall structures such as the Guggenheim Museum and the White Bridge are transformed into magical light sculptures. Museums aren't just about looking to the past - they can also shape the future. That was the message at this year's European Cultural Brand Awards in Berlin. 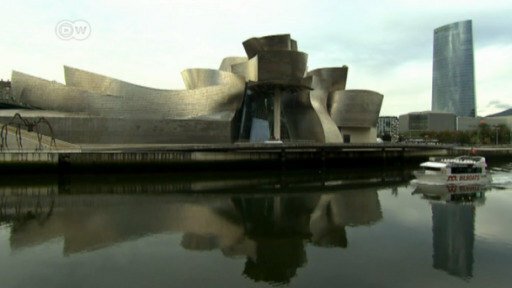 The top prize went to Frank Gehry's landmark Guggenheim Museum Bilbao. The Guggenheim Museum in Bilbao, created by Frank O. Gehry, celebrates its 20th anniversary. And it is not the only spectacular building by the internationally renowned Canadian architect. It's not just another epicenter of contemporary art. Two decades ago, the Guggenheim Museum in Bilbao completely changed the city and turned the once dying Basque capital into a modern metropolis.